I don’t know about you, but I am tired of poor quality Chinese products that are expensive and need replacing more often than the American made. 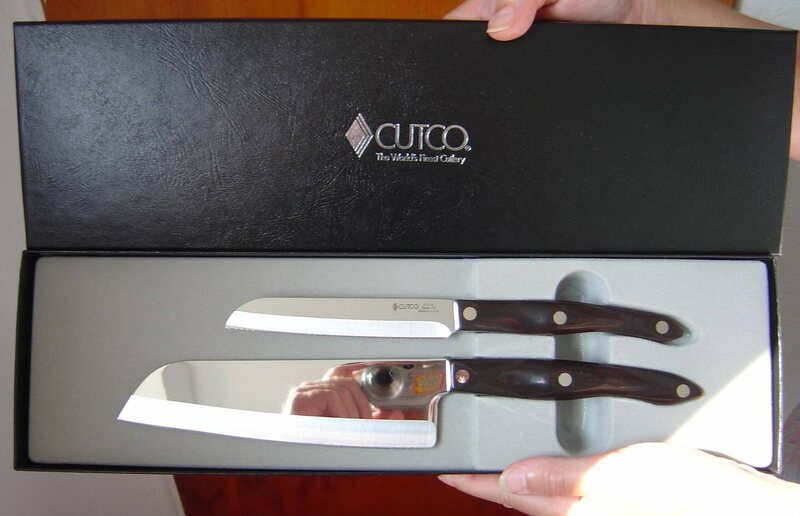 However, CUTCO Cutlery is proud to continue their tradition of American-made excellence since 1949. As you can imagine, I was delighted to work with this company on this review and giveaway of their Santoku-Style Cook’s Combo Knife Set. As you all know, I do a lot of cooking. In the process, I have tried plenty of different types of knives. Like most people, I usually had my favorite for chopping vegetables and another for meats. Those two knives were the best for chopping in my house–that is until my CUTCO Santoku-Style Cook’s Combo Set arrived! I love how easily these knives glide through vegetables and meats to simplify cooking. Their special step treating process to heat, treat, deep freeze, and then oven temper the high-carbon stainless steel blades ensure this top performance and durability for each of their innovative Double-D edge or straight edge blades. Besides, their handles are comfortable to hold while being triple riveted and built to last. Check out the handles of these knives. Unlike other serrated-edged knives, the CUTCO Double-D edge knife is the smaller one shown, the Santoku Trimmer, cut and trimmed meats cleaner without ripping up tissue. Furthermore, you can have this knife factory sharpened unlike other serrated-edge knives. The bigger knife in this combo is the large Santoku 7-inch smooth-edged blade. With this razor-sharp knife, I breezed through chopping vegetables in no time. Honestly, you can get out of the kitchen quicker if you only have the right tools like this CUTCO Santoku-Style Combo Set. Now that I am spoiled and will never go back to my old knives. I will pack them in my container for the next time I want to sell some things at the flea market. What really impressed me about CUTCO’s knives is that each comes with a Forever Guarantee, that includes free lifetime sharpening and a 15-day money back guarantee. The CUTCO Santoku-Style Cook’s Combo Set retails for $158 in the United States and $202 in Canada. Purchase CUTCO knives exclusively from independent sales consultants here. The company also offers a gift registry service as well. This is a beautiful set of knives. I would love to try one of their Chef Knives. Either one looks like it would help a great deal with prepping for dinner.